I was delighted to receive this Liebster Blog Award from Pamreader. I've followed Pam's blog and on Twitter for some time now. Her posts are always entertaining, I've picked up some great book tips and I've vowed that one day soon I will make the trip to Nottingham to see her at her Book Group. Pam's blog informs me that the word Liebster is the German meaning of dearest. 1. Thank the giver, and link back to the blogger who gave it to you. 4. Hope that the people you have awarded it to forward it to their five favourite bloggers to keep it going! Lainy, my friend from Scotland who blogs here. I met Lainy via www.readitswapit.co.uk and she's been a great friend to me, I was lucky enough to meet her in real life at our Reader's Day in Birmingham this year. Lainy blogs about some really unusual books. I love her, she's a little star! Josie and her adorable ginger cat Jaffa tell us all about their adventures with books at Jaffa Reads Too. Josie is another lady that I know through Readitswapit, and although I've never met her in person, I feel as though she's been a friend for a very long time. Linda lives in Italy, she blogs about her life there at Lindy Lou Mac In Italy, she is also an avid reader, just like myself and tells us about the books that she has enjoyed here. 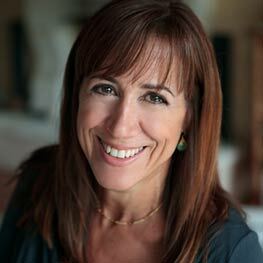 I really enjoy reading about Linda's Italian life and also her wonderful holidays. Last Christmas a friend of mine sent me a wonderful recipe book called A Slice Of Cherry Pie, and I've spent most of this year trying out the lovely ideas. 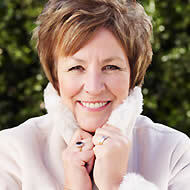 The book is written by Julia Parsons and evolved from her blog which you can find here . 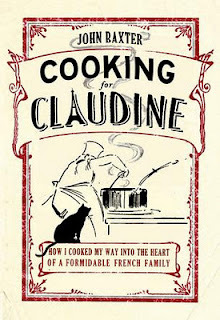 After books and reading, cooking and eating is my next love so any foodie books are always welcome in my house - this one and the blog are amongst the best. One of the most exciting new British writers around is Jenn Ashworth, who also writes an entertaining blog, check it out here. Jenn writes topical and up to the minute books, she doesn't hold back and can often be shocking but her talent shines through. She's going to be huge! Thanks so much Pam, for giving me this award and letting me pass it on to other fabulous bloggers. What a great title for a book, it most certainly caught my attention and made me look twice, and reading the synopsis convinced me that Her Giant Octopus Moment by Kay Langdale was going to be just my cup of tea. Due to be published in January 2012 by Hodder and Stoughton, this is Kay Langdale's third novel, but the first of hers that I have read. 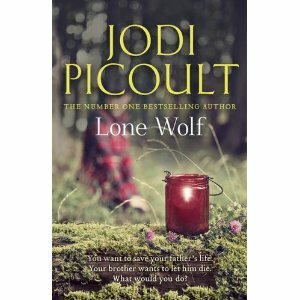 The story centres around two main characters, Joanie Simpson and her eleven year old daughter Scout. Joanie was never supposed to be a mother, not in the conventional sense anyway. Joanie had made one of her trademark snap decisions and offered to be a surrogate mother, her next snap decision was to decide to keep her baby after all, destroying the dreams of the potential new parents and changing her own life forever. When an eagle-eyed embryologist spots Joanie and Scout in a park eleven years later, their past starts to catch up with them. Scout Simpson, named after Demi Moore and Bruce Willis' daughter and not taken from Harper Lee's novel as most people would assume, is one of the most wonderful child characters I've ever come across. Despite her gypsy-like lifestyle and Joanie's dubious parenting skills, Scout is a happy, adaptable little girl with an enormous thirst for knowledge who loves nothing better than to teach herself a few words of a new language, or to work out a difficult mathematical problem. When Joanie receives a letter from Social Services, their flight begins. Scout is dragged from place to place, not attending school but learning all the time. From a cold and lonely block of flats in Birmingham to the fruit fields of Norfolk, Scout adapts and learns. A story about motherhood about survival and about surrogacy. A story about choices and why people make them, and their consequences. Just what makes a good mother? Is it someone who is there when you finish school? Someone who makes sure you are fed and your teeth are brushed? Is is someone who brings adventure into your life, and shows you new places and experiences? Kay Langdale draws fabulous characters, both Scout and Joanie are lovable and real. Mr Groves, the ex butler who lives in the flats in Birmingham is beautifully described, a gentleman who teaches Scout about the finer things in life, and Mr Mohammed, the shopkeeper who makes sure she is learning something new every day. Both funny and poignant, warm and witty, with some fabulous characters and a thought provoking plot line - I enjoyed the read immensely. 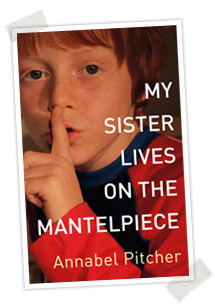 All the cliched terms can be applied to Annabel Pitcher's wonderful novel, My Sister Lives on the Mantelpiece published earlier this year by Orion Books. "Beautiful, stunning, blown away" and the rest can all be used to describe my feelings about this fabulous debut novel from an incredibly gifted young author. I don't have many connections these days with ten year old boys, and wondered whether I would relate to James's story. It only took a couple of pages for me to fall completely in love with his character, his language and his feelings. James and his sister Jasmine are living in a remote Lake District village with their Father, not cared for by their Father, just sharing a house with him. Since their sister Rose was killed five years ago by a terrorist bomb in central London, their family has slowly fallen to pieces. Dad drowns his sorrows in the bottom of a beer can whilst worshipping the urn of Rose's ashes that lives on the mantelpiece and ignoring the needs of his remaining children. Mum upped and left them, to go to live with Nigel from her 'support group' - turning her back on the grief of her husband and making a new life for herself is her way of coping. James and Jasmine deal with the after effects of this in their own little ways. Jas decides to dress in black and dye her hair pink, that's her public face, her private way of coping with things includes not eating until her bones stick through her clothes and bunking off school to spend time with her green-haired boyfriend. James has Roger the cat to comfort him, along with his Spider Man inspired dreams and most recently Sunya - the girl he sits next to in school. Sunya is a Muslim and 'Muslims killed Rose', well, according to his Dad they did. James struggles terribly with what his Dad has told him about Muslims and how he feels about Sunya - he's is split down the middle. Should he please his Dad, who ignores him? Or should he spend time with Sunya, who appears to care for him and makes him happy? 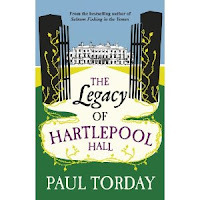 This is very very brave writing, it tackles relevant and topical subjects heads on with painfully honest writing and wonderfully realistic characters and settings. The story is compelling, it's often heart-breaking but it's often joyful - just as young children are in real life. Although aimed initially at the Children and Young Adult market, adults should read this and learn. An outstanding debut novel. 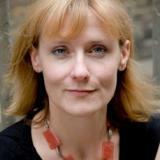 I believe Annabel Pitcher's next book is due for release early next year - I will be first in the queue to buy it. I was 16 in 1984 when Channel 4 was launched and I remember it clearly - the first programme was Countdown, followed by Brookside. I was hooked from the first episode. Brookside was a soap opera like none of the others, fresh and new and dared to cover issues that hadn't been seen before on a soap. I watched it from episode one right up until the end - even through the very odd storylines towards the end. Although Sue Johnston is now more famous as Barbara Royle from the Royle Family, she will always be Sheila Grant to me. I loved the Grants. Sheila and Bobby and three children Barry, Damon and Karen. I had a massive crush on Barry Grant played by Paul Usher. 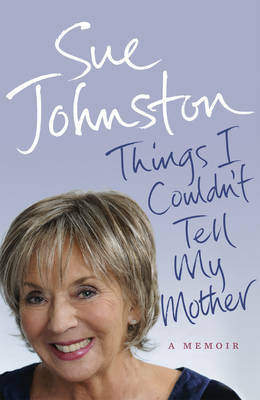 Things I Couldn't Tell My Mother published by Ebury Press is Sue Johnston's memoir and it's a warm and honest read. You can almost hear Sue's voice as she tells of her childhood, her relationship with her parents, her marriages and her career. What struck me the most is the fact that Sue has stayed 'real' throughout her career, despite the success and the fame and the OBE, she never strayed far from her roots and never lost that no nonsense attitude or her belief in social justice. Sue's relationship with her Mother is a theme that runs throughout the book, they loved each other, of that there is no doubt, but it was never an easy love. Sue never felt that her Mother was proud of what she did and knew deep down that if she had married a plumber, stayed at home and had two kids, her Mother would have been happier. Despite this, their relationship was strong and her recollection of their last days together is very moving. This is not a showbiz gossipy type of memoir, although Sue has many famous friends, this is a story about a real woman, who achieved her dream and has stayed true to herself. 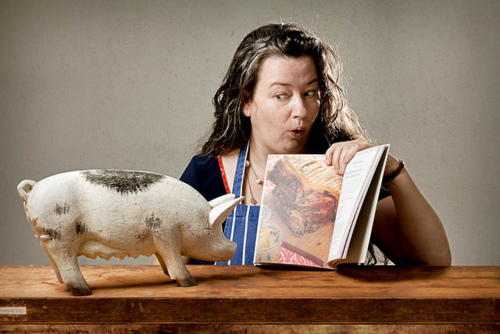 Niamh Shields is the person behind the food blog Eat Like A Girl and Comfort And Spice, from Quadrille Publishing is her recipe book that complements the blog. The book is beautifully presented, my copy is somewhere between a hardback and a paperback, with the cover made from a cardboard material which folds out inside and contains some wonderful colour pictures. The majority of the recipes are illustrated and each one has an introduction from Niamh, telling the reader about the dish, it's history and what it means to her. The recipes are easy to follow, with simple, easily found ingredients and every one that I have tried so far has been delicious. 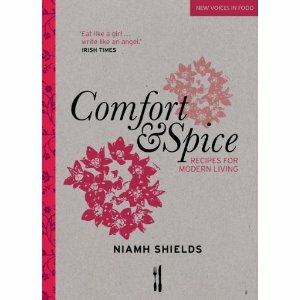 I'm a massive fan of cooking with pork and so is Niamh, I especially love slow cooked belly of pork and have recently tried pig's cheeks for the first time - Niamh is passionate about the use of these ingredients and there are some great new ways of cooking them described in the book. 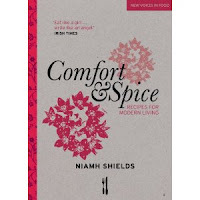 This had already become one of my favourite cookery books - I'm looking forward to more from Niamh. Back in July I reviewed and enjoyed Martyn Johnson's first book What's Tha Up To?, you can read my thoughts here. My review was spotted by Emma from Martyn's publisher; Pen And Sword Books and she kindly sent me a copy of his second memoir What's Tha Up To Nah? for review. What's Tha Up To Nah? is not a sequel or a follow on from Martyn Johnson's first book, but more stories from the same era. Yet again his humour and compassion for other people and his love for the city of Sheffield shine through each story. Martyn Johnson is a born story teller and the reader is soon captured up and taken back to the days of the bobby on the beat, police boxes, a clip round the ear and respect for the local copper. Like his first book, this one contains some incredibly funny stories and some extremely sad and heart breaking recollections too. From dealing with the death of a small boy who has been run over to the suspected shoplifter with a pocket full of combs, Martyn Johnson could adjust himself to any situation, handling each one with care and sympathy, and sometimes with the back of his hand! 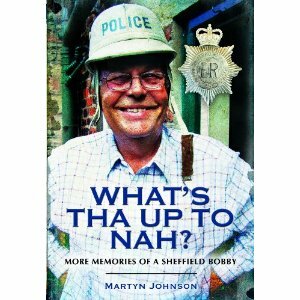 The city of Sheffield and it's people are the main stars of his stories and whilst the city may have changed dramatically since the days that Martyn walked the beat, the people and the humour are still there. I hope that Martyn Johnson has more stories to tell and that he will continue to share them with readers for a few more books yet. 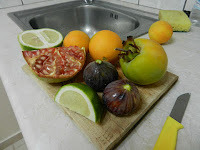 Just a little note to say that I will absent from my blog for a while. We fly to Kos in the morning for a much needed break. 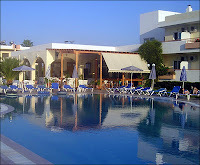 Kos is a new Greek destination for us, although we have visited neighbouring Rhodes - many years ago. I'm hoping to read lots, drink a bit and eat even more! The past couple of weeks have been so hectic for me, I've had a few health-related things to deal with and work is just hectic. On Wednesday we fly to Kos for a week of relaxation and I'm so ready for it. I think all this hectic rushing around has affected my reading and I've picked up and abandoned at least three books lately. I was beginning to despair, I thought I'd lost my reading mojo completely. 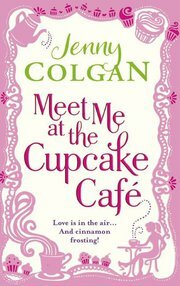 So, browsing through the shelves of books to be read and out jumped Meet Me At The Cupcake Cafe by Jenny Colgan. The cover is beautiful and there are cakes in the title, surely this would mend me? Oh yes! Yes, it did! Jenny Colgan has delivered a feel-good, warm and entertaining story full of great characters and mouth watering cake descriptions. There are recipes included throughout the story and I'm determined that I'm going to have a go at some of them. The story is about Issy, an ordinary London girl who is made redundant. Issy was brought up by her beloved Grandpa who was a master baker, she is warm and genuine and loves baking. On the spur of the moment she decides that she is going to use her redundancy money to open her very own cupcake cafe. The reader then accompanies Issy on her journey to become a businesswoman. 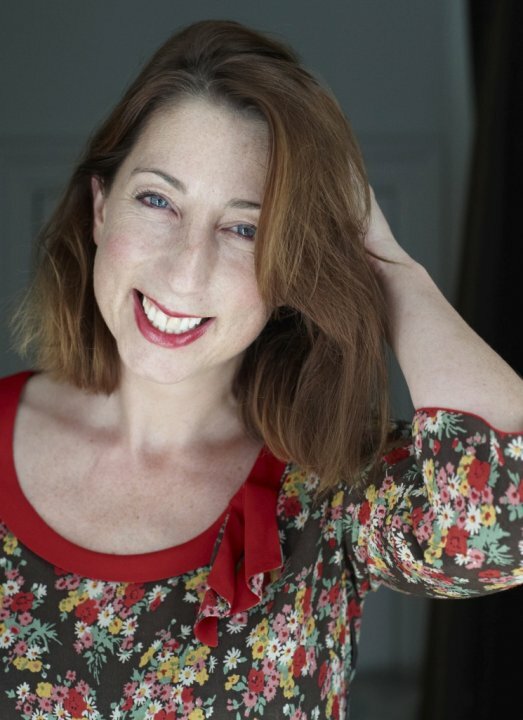 Jenny Colgan is an expert in characterisation, the great guys really are fabulous, I just loved Caroline - the stick thin yummy mummy who has been dumped by her husband and can't bear the thought of having to live anywhere with less than three bathrooms. Then there is Austin, probably the world's daftest Bank Manager - but oh, I did fall in love with him and his sticky out hair and pockets full of catapults! The bad guys are nasty, very very nasty, the sort of villain that would get a boo every time they came on stage in Panto. 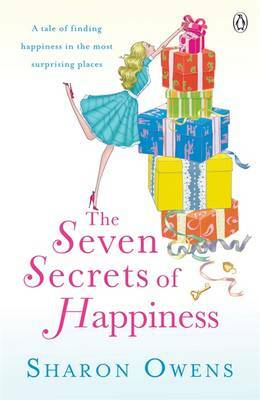 Thank you Jenny Colgan for getting my mojo back! I'm hoping that Issy's story may be continued in another book some day, there is definitely scope for more! A wonderfully fulfilling story, I loved it. 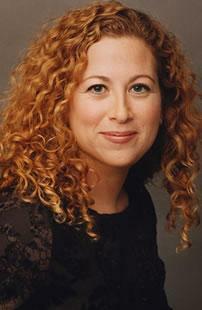 Amanda Coe is a successful television script writer, she is co-writer of Shameless and the creator of As If. Both of these shows are gritty, down to earth, shocking and no-holds barred viewing and her debut novel; What They Do In The Dark is exactly that too. If you are shocked by stories of dysfunctional families, or offended by bad language, violence and abuse then this story is probably not for you. If, like me, you appreciate fiction that really does mirror real life, then you will most likely be hooked by this extremely written, shocking novel. 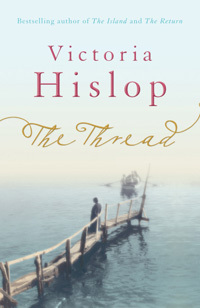 Set in Doncaster in the 1970s, the story centres around three young girls, all very different, but all linked together. Gemma lives a fairly average life, she's clean, has pocket money and goes abroad for her holidays. Pauline, on the other hand, comes from an infamous family. Totally dysfunctional where violence, abuse, dirt and hunger are the norm. Pauline's mum is often away from home, her Nan is dependent on prescription drugs and Pauline is left to fend for herself. She is dirty, she smells, she fights and swears, and nobody likes her. 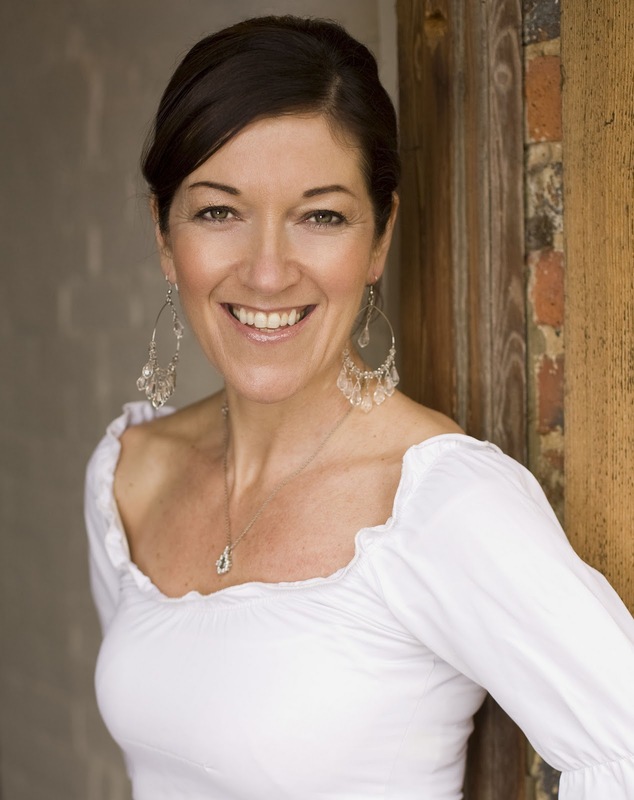 Lallie is a child star, with a weekly TV programme, an overbearing theatre mother and adored by Gemma. This novel took my breath away at times. Amanda Coe has created characters that are flawed so badly by life, yet are not sentimental in any way. The writing is stark and detached, narrated by various characters with a vividness that is really outstanding. This is a story of neglect, of betrayal and of incredible sadness and culminates in a horrific and shocking act. Every associated character can link into the fate of the these girls, adults who are indifferent, who are selfish, or just don't see how their actions can affect the children who are in their care. I was exactly the same age as these girls in the era that it was set. I lived just 20 minutes away from Doncaster and we often shopped there as a family. I recognised the settings, some of the people and the air of apathy that is a theme throughout this story. This is fiction, but could be true, it is realistic, it is hard to digest, but it really is an excellent first novel. Wink Murder by Ali Knight - Giveaway Winner Announced! I'm delighted to announce that the winner of the giveaway is LindyLouMac in Italy. Congratulations LindyLou - please let me have your address, you can email me or send it via my Facebook or Twitter pages. I really hope you enjoy the book and I'd love to hear your thoughts when you've read it. Many thanks to everyone who entered, look out for some more freebies soon. Working It Out is a self-published novel from author Nicola May. It has a beautiful cover and looks extremely professional - the quality of the print and the paper is very good. This is Ruby's story. Ruby is 30, and has just been made redundant from her high flying marketing job. She has the nice flat and the designer furniture, she's been living the good life and all of a sudden she is faced with unemployment. Ruby discovers a quote from Kahlil Gibran - the author of The Prophet, she realises how true it is and decides that she will no longer work long stressful hours in an unfulfilling job. Ruby formulates a plan, in order to find a job that she loves, she will take 12 temporary jobs over the next 12 months. The novel follows Ruby from job to job, meeting her work colleagues, her friends, family and neighbours. 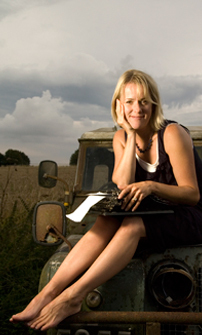 This is a clever idea for a novel and enables Nicola May to introduce the reader to a wide and varied cast. Some of the characters are more developed than others - some have only minor parts. Ruby takes on such a variety of jobs during her 12 months, but my favourite of her jobs was her first. She was a nursing assistant in a retirement home for elderly celebrities. It is during this job that the best characters were introduced, and where Ruby seemed to be very happy. 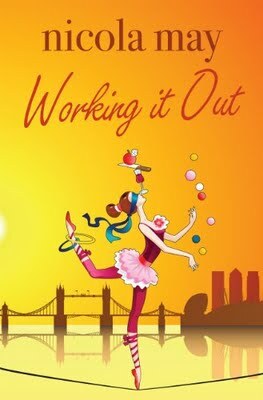 Working It Out is an easy read, it's fun and quirky and just a little bit different. However, it is not without it's faults. I liked Ruby as a character, she was genuine and kind hearted - spending time with her elderly neighbour and taking in an 'orphaned' dog. Every now and then though her character seemed to change altogether and it was usually where men were concerned. Ruby's kindness and goodness flew out of the window and she turned into what can only be called a slapper. Every man she came across fancied her - she almost jumped every one of them. It niggled me. Whenever the story turned just a little romantic, the language became crude and just didn't fit with the characters. On the whole though, it's a great idea for a novel and it's easy to read and puts a smile on your face - I'd just prefer Ruby to get her mind and her language out of the gutter sometimes. Thanks to Nicola May for sending a copy to me to review. 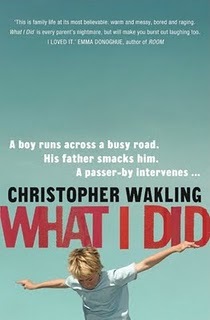 The blurb on the back of What I Did by Christopher Wakling intrigued me so much that I just had to pick this one from the Amazon Vine programme. I've had my nose firmly stuck between the pages for the past couple of days - this really is a wonderfully clever book. The central storyline of What I Did could happen to any family. Imagine, you are out in the park with your six year old son. Both of you are in a bad mood - it's early, you have work worries, you'd rather be in bed. Suddenly your son runs off, over the park, through the trees and makes his way towards a busy road. You chase him, shouting for him to stop. You see him run out between parked cars, you see the traffic, your heart thuds. He's lucky, he stops, he's unhurt. You grab him - you smack him. You are so relieved that he is OK, but so damn angry too. And so, that is the beginning of the story. Narrated by six year old Billy, and seen purely through his eyes, with his kind of mixed up feelings about his angry Dad and his pure innocence and honestly, that only cause the family more and more heartache. Billy is a wonderfully drawn character, bright as a button, intelligent, obsessed with David Attenborough and wild animals and the attention span of an ant. At first his voice is a little difficult to relate to, he often muddles his words and at times he goes totally off-track, into random observations and information relaying. This only adds to his character, and makes him more lifelike. Six year old boys are like that, this is real life. Somebody saw Jim (Billy's Dad) smack him, she confronted him and Jim told her where to get off - that was his second mistake, after the mistake of smacking Billy. Soon the family are visited by Social Workers and so begins a round of examinations, case conferences, meetings and accusations. Throughout all of this, Billy's voice is loud. He answers the questions in his honest way - but it is the adults who get things wrong, they interpret his answers to mean different things, and Billy, in his innocence does not realise this. Jim loves Billy, there is no doubt of that. Jim is also stubborn, short tempered and at times very angry. He swears, works too hard and drinks beer. He will not co-operate with the agencies involved, he makes things worse - for himself and for Billy. This is a clever, entertaining, sad, funny and heart warming story. It is about real life, about mistakes that are made and about the innocence of childhood. I loved every page! The Obscure Logic of the Heart by Priya Basil is my third choice from the Transworld Book Challenge project. The publishers have been marketing this story as 'Romeo and Juliet for the 21st century', so it wouldn't be unfair to expect a love story with some tragedy. I wasn't disappointed, but although the story of Anil and Lina's relationship is the main theme to the novel, there is so much more than this. It is a complex novel, comprising of many different themes, from the illicit love affair between a Muslim and a Sikh, to the illegal arms trade in Kenya. Anil and Lina are two young people who meet at university and gradually fall in love. Their religions are not the only thing that is different about them; Anil comes from a wealthy background and has never really had to work for anything. Lina, on the other hand comes from a working class family in Birmingham, her parents are devout Muslims and they are a tight, loving family. Basil is an expert at crafting realistic characters, not just the two main leads but the accompanying characters are just as well rounded, it is clear that a lot of thought has gone into who Anil and Lina would allow into their world, who they would trust and why. I really enjoyed this novel, I enjoyed the love story and the mysterious back story that ran alongside it - Basil uses some old 1960s correspondence, spaced between chapters every now and then - this adds a touch of intrigue to the story. A novel that is very relevant to the world today, well written, with a great plot and interesting characters. 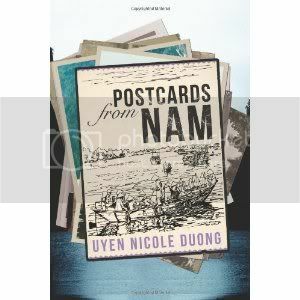 I requested Postcards From Nam by Uyen Nicole Duong through the Amazon Vine programme a couple of weeks ago. I chose this book from the Amazon Vine newsletter, the premise of the story really appealed to me, and I've not read many novels set around Vietnam before - so was interested to learn a little more. This is a novella really at just 100 pages long, but every one of the pages contain words that really touch the heart. Mimi is a succesful lawyer based in America, she is a Vietnamese immigrant who has americanised both her name and her lifestyle. Mimi's family were lucky enough to be able to leave their home in South Vietnam just before the North took over. Other family members and friends were not so lucky though, and Mimi has distanced herself from the memories of her past. Then, out of the blue, postcards begin to arrive. Beautifully, hand drawn postcards that are personal to Mimi, and to her past. Who is sending them, and why? What do they mean? After speaking with her family, it becomes clear to Mimi that these cards are being sent by Nam. Nam was a childhood neighbour back in Vietnam and Mimi has heard nothing from him for years. Determined to find out more about the cards and about Nam, Mimi tracks down refugees and learns through them, of Nam's ordeals over the past years. He has suffered dreadfully, yet still he remembers her. There are some haunting passages in this short novel, the terrors suffered by Nam over the years are harsh, yet his love for Mimi never dies and his art work iives on. This is a beautifully crafted story. 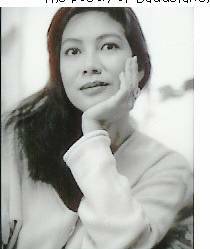 Uyen Nicole Duong was born in 1959 in Hoi An and grew up in Saigon. Her family fled Vietnam on April 30 1975. She is a professor at the University of Denver and has also written a novel called Daughters of the River Huong. People have probably gathered that I like food! Eating it, cooking it and reading about it. I'm a sucker for restaurant reviews too - even places that I'm never likely to visit. I'd love to be a food critic! I got an email from www.hot-dinners.com a couple of weeks ago - I'd won a competition on their website. My prize arrived today - a set of ProCook Gourmet Steel Pans. I'm really thrilled as my saucepans are ancient and really need replacing. So, now I have some lovely shiny new pans - and Costa and Nero have a new box to play in! What is it with cats and boxes? As soon as I unpacked the pans, put all the stuffing in the empty box, Nero jumped in and stayed there for a while. As soon as he got out, of course, Costa had to have a go too. My two daft cats never cease to make me smile! I'm really thrilled as my saucepans are ancient and really need replacing.